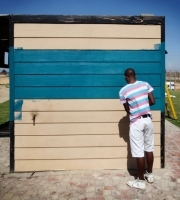 Through a number of simple interventions we worked with Lorelle Bell and Safmarine to upgrade a community cycling centre in Khayelitsha. 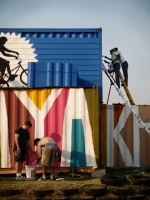 Velokhaya, described as previously being a killing field, is a community road cycling and BMX hub. Slowly but surely the center is becoming a community hub, functioning not only in its intended capacity, but also as a sort of day-care facility, birthday venue and even a setting for music videos. 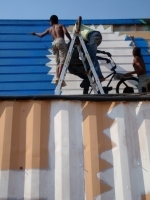 The idea that Velokhaya should increasingly operate for the community, in conjunction with the prerogative of fostering pride as well as a sense of ownership, underpinned the design process. Therefore each intervention required participation and direction in the formation stages from the users. 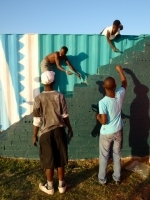 Boamistura in conjunction with WriteonAfrica sketched out artwork that could then be co-painted by everyone at the centre. The artwork brightly transformed the entire centre into a massive billboard. Khayelitsha is hot and dry in summer so we installed a simple misting system that the riders and spectators could use to cool off on race days. 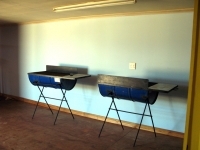 Barrel braais to cater for a large community event and a gas catering unit to get past the lack of electricity were manufactured and sourced. The wall and part of the kitchen counter were transformed into a magnetic notice board. 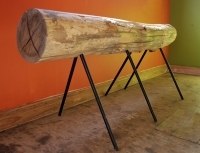 Seeing as we needed to provide a lot of cheap seating we sourced alien eucalyptus logs and added legs to create cost effective 3 person benches. 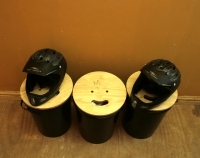 Hangers for member helmets were installed and we designed a basic bucket seat for storage and seating. 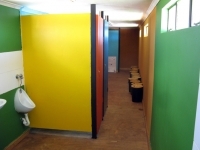 Colours from the exterior were toned down for the painting of the entire interior, and simple decals painted to indicate male and female toilets. 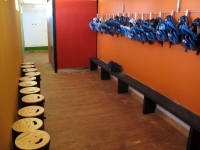 The floors were oiled with the thought that linseed oil, being cheap and easy to re-apply would make it possible for members to maintain the floors. Food preparation and consumption is one of the central things people gather around, steering us toward kitting out the kitchen with crate drawers, cretestone slabs and simple shelving. Finally we created wish wind mobiles out of waste milk cartons that were set into the fence. 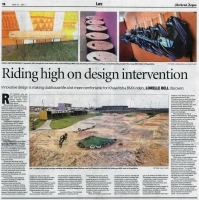 Featured is this Design Observer article.